The season is officially over. 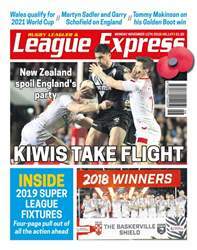 But while the England players go on a well-deserved break, the League Express team are refusing to have an off-season as we go into overdrive to bring you all the latest news in the game. Here’s what we’ve got this week. Reaction from England and the Kiwis following the third and final test. We have a four-page wall chart of Super League fixtures, round by round and club by club. We bring you news of a done deal from Hull KR. There’s a fresh update on the future of Jake Mamo. A recruitment update from Warrington. The full story on Toronto’s appointment of Brian McDermott as their new head coach. Leeds have commenced talks with one of their top players. We reveal who. On Leeds, there’s a Q&A inside with new Leeds coach, Dave Furner. Former London Broncos star Steele Retchless is our Rugby League Hero. The latest on the future of Keighley Cougars. All of that, plus news from every club in Super League all the way down to League 1, plus the latest from the junior and grassroots game is inside. Can’t wait until it hits stores on Monday? Head to totalrl.com/LE to get your online copy from Sunday night.